Rangers have been fined £5,500 by a Scottish Football Association judicial panel for breaching "dual ownership" rules relating to Newcastle owner Mike Ashley. Ashley, who has a 9% stake in Rangers, was himself fined £7,500 last month for the same offence. A disciplinary tribunal deemed Ashley had influence in the Ibrox boardroom. 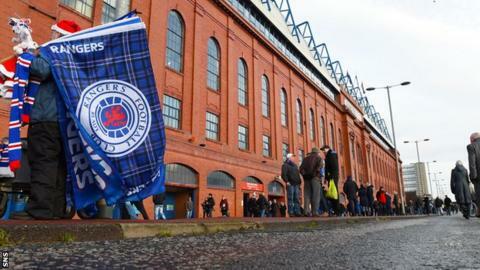 The bulk of Rangers' fine was imposed for failing to act towards the SFA with the utmost good faith. Rangers were also fined £500 as Ashley was deemed to have influenced the management or administration through the appointment of business associates Derek Llambias and Barry Leach to the club's board. Ashley has made cash loans to the cash-strapped Scottish Championship club, holds commercial contracts and had Llambias and Leach operating as chief executive and finance director, respectively, on the Ibrox board until they were removed at an extraordinary general meeting called by Dave King. In December, the SFA refused to allow Sports Direct owner Ashley to increase his stake in Rangers International Football Club to 29.9%. He had previously signed an agreement that limited his shareholding to 10%. "Except with the prior written consent of the Board: (a) no club or nominee of a club; and (b) no person, whether absolutely or as a trustee, either alone or in conjunction with one or more associates or solely through an associate or associates (even where such person has no formal interest), who: (i) is a member of a club; or (ii) is involved in any capacity whatsoever in the management or administration of a club, or (iii) has any power whatsoever to influence the management or administration or a club, may at the same time either directly or indirectly:- (a) be a member of another club; or (b) be involved in any capacity whatsoever in the management or administration of another club; or (c) have any power whatsoever to influence the management or administration of another club." All members shall:(b) be subject to and comply with (i) the Articles (ii) this protocol. (f) behave towards the Scottish FA and other members with the utmost good faith.